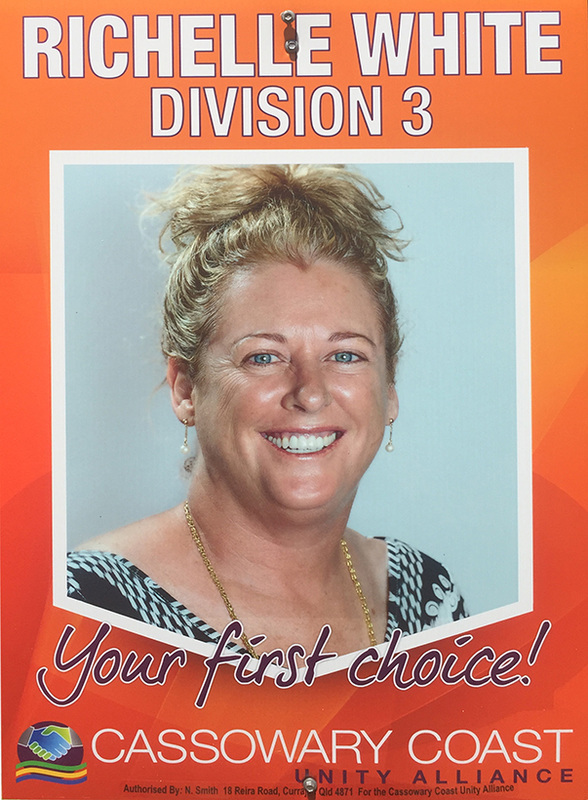 The following was sent to all Division 3 and Mayoral candidates to find out who will be the best representative for our area. Mission Beach Cassowaries Inc (MBC) works to raise awareness of the cassowary by gathering and sharing information on a very active facebook page. We are members, and attend meetings, of the Cassowary Recovery Team and other organisations that can influence decision making to protect the cassowary and our world heritage values. The MBC facebook page has just over 1200 members and is growing steadily with a local, national and international audience. It sends a strong message about the importance of the cassowary to our community, environment and economy. If at the coming elections you became a CCRC counselor, you will be responsible for making decisions that will either protect or degrade our shire/region. Our region/shire is internationally recognised for its natural values (including its natural beauty), attracting international visitors who support tourism, our major economic enterprise. We understand the constraints of limited council resources. 1. how will you be a strong advocate for funding to address the three main threats to the cassowary, i e protection of cassowary habitat, traffic management and responsible dog ownership? 2. How will you give democratic representation to all active members in the community? 3. How will you ensure your decisions are based on scientific information and recognised expert knowledge? 4. Will you make sure you vote to ensure that council decisions support our tourism economy by protecting our world heritage status? Thanks for the questions, which I will answer in turn. 1. Funding organisations (CCRC included) are always financially constrained since no one has unlimited funds, so there is always a limit to the quantity of resources (money, people, machinery etc.) available for allocation. With that in mind, the job of resource allocation becomes thereafter, one of prioritisation, “do we fund this project over that project” and so on. a. The Southern Cassowary is one of the most threatened species in this country, hence it’s inclusion last month in the “Australia’s Threatened Species Strategy” as launched by DoE minister Greg Hunt MP. b. The Southern Cassowary is an iconic bird, the presence of which throughout the Cassowary Coast is an essential pillar of the business and tourism industry. This is especially true of Mission Beach, home of the “Big Cassowary”. 2. 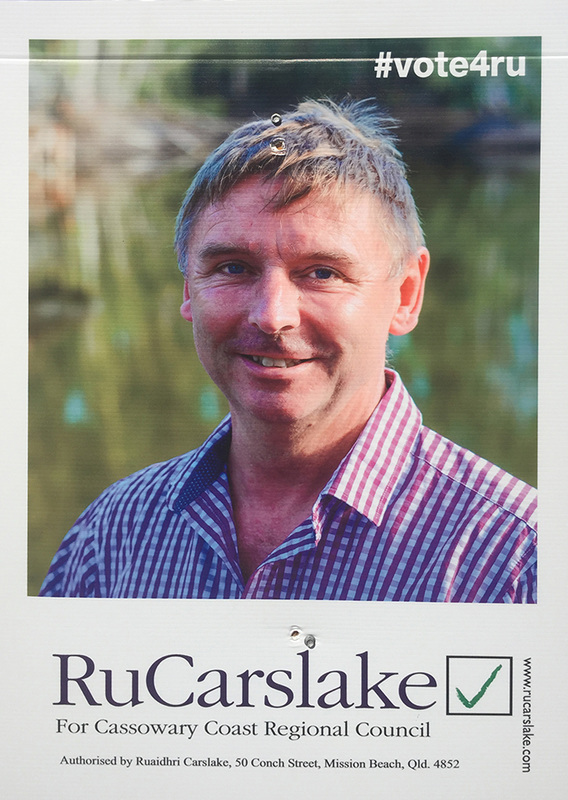 I have provided a comprehensive answer to the question of my own accessibility as well as my proposal for council engagement on the “Pledges” page of my website http://rucarslake.com/pledges/. Please let me know if you require additional information. 3. If you can refer to the “About” page of my website at: http://rucarslake.com/about/, you will see that I have spent most of my working life implementing change in large organisations. Typically my job would be a contracted position of one to two years duration working in complex environments for a businesses about which I will never know as much as do the people for whom I work. As such I hold the greatest respect for subject matter experts, whatever their field might be. 4. And in response to your last question Liz; yes, absolutely I would. Liz, thanks for the questions. Firstly let me say that as someone with almost three decades of experience working and volunteering in the conservation arena (particularly with regard to reefs) I am very aware of the challenges that we face when considering environmental protection. 1. I will absolutely be a strong and vocal advocate to secure any funding available to address the issues you mention. Obviously in Council's relatively financially stressed position any help we can get from State or Federal sources is to be welcomed. Our natural environment is one of our greatest asset (arguably the single greatest) so looking after that asset, as we should do with all assets, is vital. 2. Everyone in our community has a right to be heard and have their concerns treated seriously. For many years I have worked extensively within our communities leading and facilitating community workshops, focus groups and the like (indeed just yesterday I was doing exactly that in Tully) so I understand and appreciate how to bring disparate voices together towards shared solutions and visions. 3. I'm a scientist by training (if you can call economics a science and not an art!) and I rely on analysing data for my living. I listen to fact and have the skills and analytical mind needed to see behind the data and numbers. My base position is always to start from analysing all of the available expert information available. That's not to say I will just take at face value what the "experts" tell us, but it does mean that I need solid facts and reason to NOT believe them. 4. 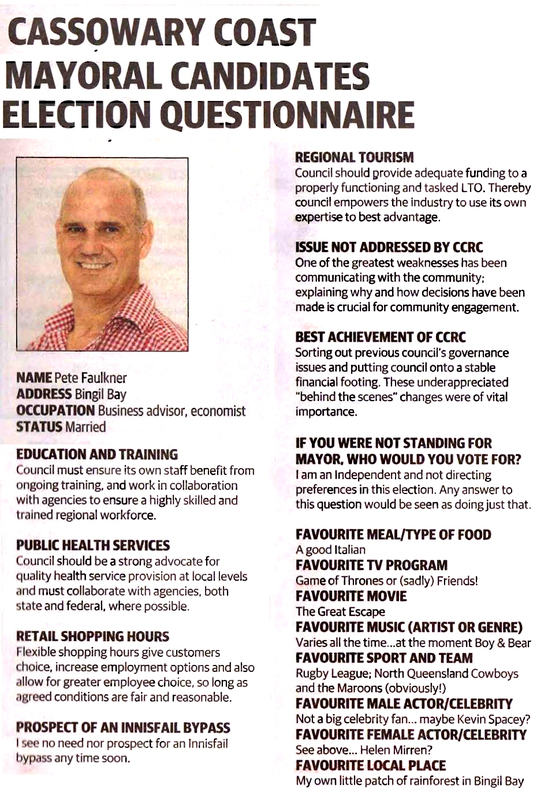 I will support and promote Council decisions that grow our region in a sustainable manner. I believe that the best way to protect natural values is to promote, not stymie, economic growth. Given the amazing part of the world that we live in then economic growth and environmental protection must go hand in hand. Indeed, one cannot exist without the other, Our World Heritage values are vital assets that we should be doing everything we can to protect. I hope that answers your questions. Please feel free to contact me to expand or clarify these or any other issues. Hi Liz, thank you for giving me the time to consider your questions. Q1. Should you be successful in securing a term as a Councillor, will you be a strong advocate to secure funding to address the three main threats to the cassowary; protection of cassowary habitat, traffic management and responsible dog ownership? A. Yes - Concerns regarding road safety, responsible dog ownership and suitable development are held in our Community in relation to the Cassowary, but have also ...been raised by residents in general. Q 2 & 3 How will you give democratic representation to active members in the community and how will you ensure your decisions are based on scientific information and recognised expert knowledge? A. Meaningful Community Engagement is vital and must underpin all that we do as a Council going forward. I will seek as much information as is available, and engage with all parties, to ensure that information gathered is accurate and rounded. All information submitted will be scrutinised and verified and made available to the public so that decisions can be made based on fact. Q4. Will you make sure you vote to ensure that council decisions support our tourism economy by protecting our world heritage status? A. Yes – we need to balance our environmental beauty with our economic needs if we are to survive and thrive. People live in and visit our region for its natural beauty and as with all things in life, we must find BALANCE to remain unique and yet viable as a regional community. Sorry it's taken me a while, but things have been a little hectic. Quest 1. Yes. 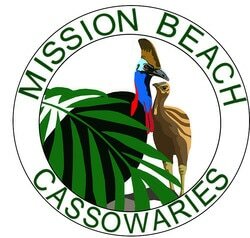 The cassowary is vital to Mission Beach and the Cassowary Coast. I have seen the excitement on visitors faces when they have seen one, and the disappointment when they have not. We all must help to protect the Cassowary. Quest. 2. While I believe that tourism is vital to Mission Beach, we must never forget why it is the people come; the beach, the rainforest and the wildlife. We must find a balance that will look after the natural beauty and the economy of our wonderful area. Quest 3. I will endeavour to communicate and consult with all groups in the area. I don't believe that any opinion or decision can be made until all information has been made available. Quest 4. I will take on board all information provided, if it helps me to learn or understand the specific subject. 1. With the federal government listing of the cassowary as one of the 20 birds for 2020 action priority list, this will give council more "teeth" to implement actions for further protection of the birds. Planning policies have traditionally identified areas that are classed as critical habitat and have added covenants to applications in those areas. It's disappointing that the current council has decided to revoke the conservation covenant agreements that were set up and adopted in good faith by landowners, particularly in light of the governments recent decision. I would advocate that council enter into an agreement with the state and Feds to maintain these and more incentive based schemes that encourage landowners maintain as much natural vegetation as possible. Traffic management is an area where the responsibilities overlap with state and local control, as you are aware the two main roads into Mission Beach are under the state and the minor roads with council. The issues about speed limiting and road maintenance have been ongoing for many years with people divided on the reduction of speed. I think that the southern road (Tully/mission) has a good mixture of speed signage and the way that the vegetation is kept back further allows driver plenty of opportunity to see wildlife on the verges. I am aware that around the Carmoo are there is vegetation that should be reduced for better visibility whilst driving. Regardless of what limits are imposed on roads there will always be irresponsible drivers who flaunt the speed limits. Maybe as a novelty approach you could place partially hidden LifeSize imitation cassowaries along the roads. It was an approach the the govt tried decades ago in south east Qld with fake police cars half hidden along roadsides, as soon drivers saw what they thought was a real vehicle they slowed down? Dogs are real problem for every council, a dogs behaviour is usually a reflection on how they have been raised (like children). There are too many irresponsible people who get a dog(s) and after the novelty wears of the animal is left untrained and in many cases able to roam and chase wildlife. With the elevation of the cassowaries status, I would be pushing council to review dog policies within recognised areas. There will be opposition from some residents who believe they have a retrospective right of ownership, and that could be addressed with stricter restraints in tandem with new laws on dog free areas. I would also be addressing the problem of feral pigs. Pigs are known to eat cassowary and turtle eggs and destroy vast amount of natural habitat but because they are generally nocturnal and these actions are rarely seen they seem to have attracted less attention by conservation groups. I believe that if the state and federal is serious about protection of wildlife in national parks and heritage areas, feral pigs should be a high priority for eradication. 2. Democratic representation is a basic expectation of anyone who is in an elected position , More so, I believe with a local govt councillor. Regardless of whether they are an "active" member or not,all residents deserve to have a councillor who will act as their conduit to council without bias. I have been in business and involved with community and sporting groups for almost 30 years and have the ability to work with and represent all individuals and or groups with fairness and honesty. 3. Individual councillors are normally unable to make personal decisions that involve council actions. Generally a councillor can have some input into recommendations that are drafted by relevant council staff, but the recommendation or policies will be detailed with acknowledgements of information from sources, such as consultants or recognised "experts". If I disagreed or agreed with a council action or policy I would definitely have researched all relevant information that would support my decision. 4. With the status of world heritage I am led to believe that it is already protected by federal legislation preventing any developments or encroachment of these designated areas? Tourism plays a major economic role for the cassowary coast region, and the majority of tourists come to mission beach for the natural Beauty of the rainforest and beaches. The protection of the rainforests and natural assets are paramount to the future of tourism. There will always be the divisive views regarding any further development of tourism and residential expansion in mission beach, but I am confident that with the combination of the new planning scheme and myself as an experienced independent councillor mission beach can attract more tourists and move forward without jeopardising its world heritage status. How will you be a strong advocate for funding to address the three main threats to the cassowary, Cassowary habitat, traffic management and responsible dog ownership ? Being the Deputy Mayor for the last four years has given me a great opportunity to establish networks with other levels of government. 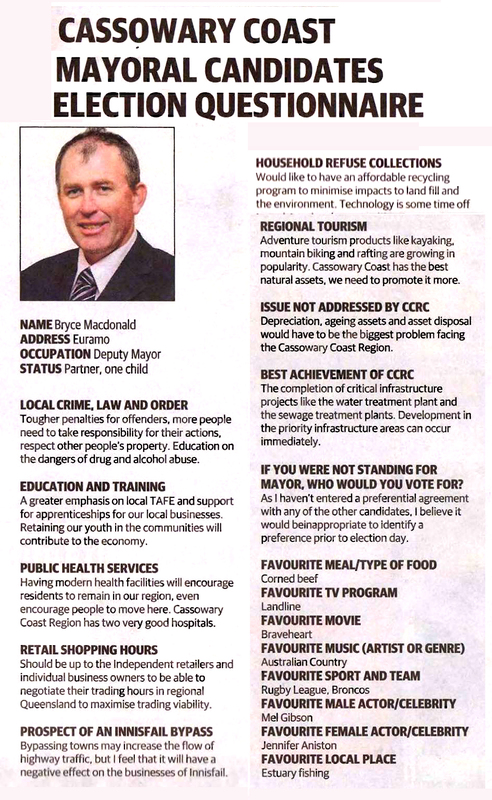 I will continue to engage with the state government to assist the Cassowary Coast Region with habitat management. The Cassowary Coast Planning Scheme also utilises State and Federal mapping to ensure that all corridors remain protected. Intervention levels for road side vegetation management on TMR controlled roads and council roads needs to be reassessed in the wet tropics not only the Cassowary Coast. I will continue to advocate for the possibility of a revised traffic management plan in areas of concern through the Traffic Consultative Committee. The importance of responsible dog ownership is a continual education process with residents of the Cassowary Coast. The dog audit will help identify problem areas so that council can target irresponsible owners and owners that have unregistered animals. How will you give democratic representation to all active members in the community? Democratic representation comes from engaging with community across the entire council area. Four years of experience as an elected member has given me the opportunity to engage at length with multiple organisations. If elected, I intend to continue this process. How will you ensure your decisions are based on scientific information and recognise expert knowledge? 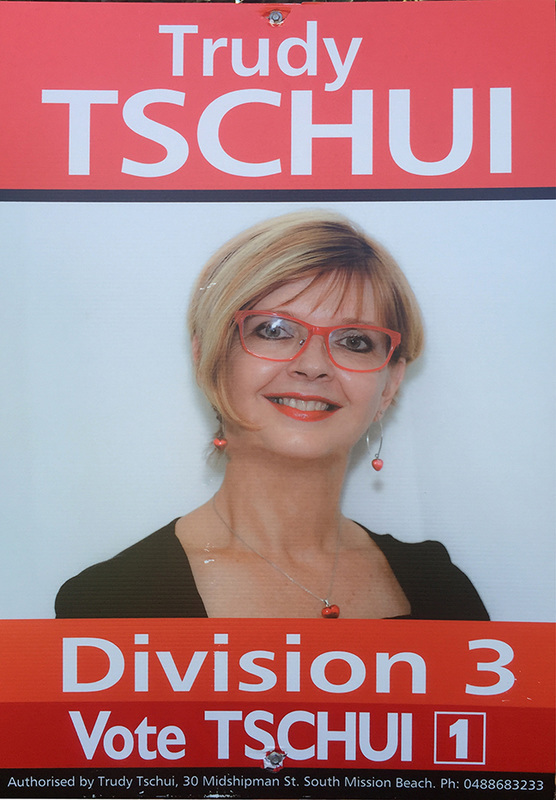 If I am elected as Mayor, council will appreciate scientific information and expert knowledge, in addition I will also ensure that council considers local knowledge, common sense and that every decision will be considered on a case by case scenario. Will you make sure you vote to ensure that council decisions support our tourism economy by protecting our world heritage status? The natural environment is a valuable asset so it is critical that a balance is found between development and what already exists. To encourage the best tourism products and create more employment in our region, I believe greater and more effective promotion is required in what are ever changing tourism markets. Our natural surroundings are our greatest assets. Thank you for the opportunity to reply to your questions. Sorry for my delay, but I wanted to be sure of my information before responding. The Cassowary Coast Unity Alliance has a very strong commitment to ensuring that Council does not limit its role to just regulation and "roads, rates and rubbish". Fundamental to our position, is a strong community engagement strategy and initiative, and through this mechanism the Council that I lead, will be in a position to represent the interests of its community and advocate for those issues which are important in this region. The Council that I lead, will be embarking upon an educational programmes designed at protecting our environment of which the cassowaries are an integral part. The Council that I lead, will be making representations to State and Federal Governments and liaising with National Parks and Wildlife and World Heritage to ensure that we secure not only, the maximum funding available, but also ensure that this funding and other resources are targeted and effective. The Council should be aware that entropy will naturally occur if positive pressure is not applied to targeting and efficiency. Cassowary Habitat - protected through application of appropriate policy attached to the Town Plan for regard in development decision making and in forming joint task-forces with relevant bodies. Traffic management - signage , speed control , liaison with police targeting key areas for speed control and education . Feral Animals- (dogs/cats etc.) Council will need to, and will, work closely with relevant agencies to reduce their impact on our environment. Community Engagement Programme data input into open transparent and honest decision making process. This programme is crucial to us and we will be listening and acting upon the wants and needs to achieve the best possible outcomes for our community. Responsible Dog Ownership - is concern. CCRC just advertised 2 positions for Local Law Enforcement Officers Are amendments required to local laws with dog control? We understand the CCRC is constrained by limited resources to address these three issues. Q. 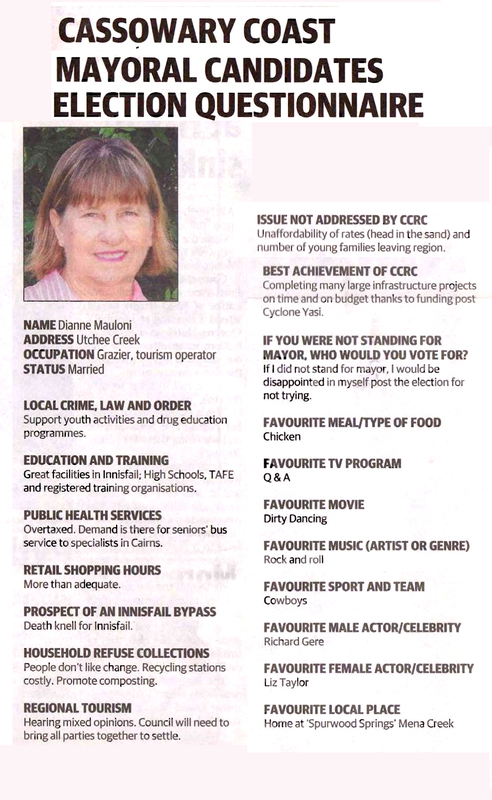 Will the CCRC candidates be a strong advocate for funding to address the three main threats to the cassowary, protection of cassowary habitat, traffic management and responsible dog ownership? A. UNDERSTAND PASSION AND CARING ROLE OF MB PEOPLE – PUSH PROTECTON CASSOWARY - ECO TOURISM GROWING INTEREST WORKED AT TERRAIN – 10 YEARS – SECRETARY LANDCARE / CATCHMENT GROUP Cass on top 20 list – due to passion / commitment of people / TS Com attending World Cas Day – hugely impressed. Q. How will you give democratic representation to active members in the community? 1) Like to think that CCRC - Respond in timely fashion to concerns of community. Q. How will you ensure your decisions are based on scientific information and recognised expert knowledge? A. Guided by cross section of information put forward. Engage experts in field and local knowledge must be included. Cr Pike has so far not responded to our questions. Mission Beach Cassowaries has lobbied Cr Pike on many issues concerning the environment over the past 4 years. Only on rare occasions has a call been returned and one email responded to. Cr Pike perhaps answered our second question How will you give democratic representation to all active members in the community? by his comments at the MBCA 'Meet the candidates' meeting on Monday 29 Feb when he stated he had a 100% response rate in communicating with the community before adding "... except for you Liz, sorry"
"In response to allegations made on a local fringe environmental website , let me say this. I have given this website and its administrator the level of response that some of the questions and enquiries deserved. I certainly have returned more than one phone call to the website administrator, that allegation is absolutely incorrect, I urge that person to check their phone records. I have engaged solidly with C4, the local recognised environment group in my tenure, we have differed on one or two matters, but we are on the same page in relation to the symbiosis that now exists between a healthy, protected environment and a healthy tourism industry. Each now realises the value of the other. As regards my own environmental credentials, as I have already said, where and when possible I ride a bike, I don't drive much locally. I have had occasion to assist Dr Graham Lauridsen in a road strike recovery recently, and learned lots from that action. I have assisted and contributed in developing a road kill reduction strategy for Cassowaries via the CRT (Cassowary Recovery Team) and Terrain Natural Resource Management, with elements of that strategy now under consideration for ACTION at a State level. Let me say again, I am not interested in fringe groups who are intent on impressing their particular will on the wider community. Councillors must govern with the best interests of the TOTAL community in mind, I am happy to stand on my record on that matter". Councillors are lawfully required to act in a manner that promotes 'local government principles' (s.4(b)(2)). Councillor's actions are governed by lawful local government principles as set out in the Act. Furthermore, Division 6 provisions relating to Conduct and Performance of Councillors under Section 176(3)(a) of the Act require 'honest and impartial performance of the councillors responsibilities or exercise of the councillor's powers”.